Originally found in rocky areas around the Mediterranean, hyssop is now cultivated in many parts of the world and is often grown as low edging in knot gardens or as a companion plant to keep butterflies from brassicas. It can be used both as a culinary herb to flavour stews and in remedies for relief and swift resolution of coughs and feverish chills. 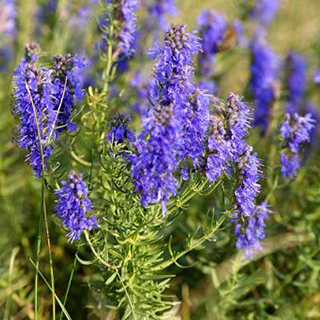 Hyssop is a stimulating expectorant demonstrating marked antiviral activity. The herb promotes the elimination of toxins via sweating and diuretic effects. Drink 1/2 cup of a hot infusion (1–2 tsp herb per cup of boiling water) every 2 hours to encourage sweating in the early stages of colds or flu. Take 40–80 drops (2–4ml) 3 times daily for gas, indigestion, bloating, or colic, especially if anxious. Combine 1 pint (600ml) of an infusion of the whole herb (or the flowers only, if you have them) with 1lb (450g) honey to make a syrup for productive coughs and catarrh. Take in 1 tsp (5ml) doses as required. Combines well with coltsfoot, thyme, or mullein flowers. Combine 1 tbsp (15ml) macerated oil of hyssop with 1ml (2 drops) each of essential oils of thyme and eucalyptus as a chest rub for bronchitis and chesty colds. Prefers fertile, neutral to alkaline soil, and full sun. Grow from seeds in trays in autumn or spring and transplant to final positions when established; allow up to 36in (90cm) between plants. Alternatively, take softwood cuttings in summer. Prune lightly after flowering, and harder in spring. Gather leaves and flower buds in summer and sprigs in the growing season.